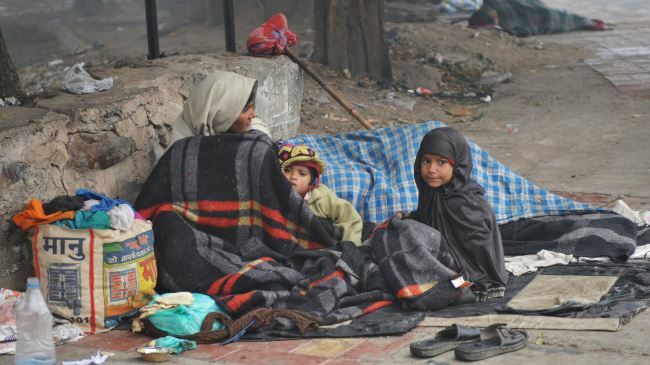 JNN 15 Jan 2015 Delhi : Hundreds of people have died in a major cold snap that has struck the Indian capital, New Delhi, as thousands of homeless people struggle to overcome the extreme cold without adequate shelter, Media reports. The development came as northern India has been facing one of its coldest winters in decades, which has claimed lives of nearly 330 homeless folks in New Delhi alone. Activists say most of the deaths have taken place in northern and central New Delhi while the figure continues to climb due to insufficient night shelters. “Cold has gone really extreme, and we don’t have ample shelters…. We have been asking the government for shelter way back from September onwards and they’ve delayed putting the shelters. So there is a large number of people who are still without shelters,” said social activist Indu Prakash Singh. According to surveys conducted by independent organizations in India, nearly 10 people die daily on New Delhi streets. Many of those who succumb to the freezing cold are young working people like balloon sellers, rickshaw pullers, casual workers, and street vendors. Prime Minister Narendra Modi pledged in his recent election campaign to provide affordable housing for the poor by the year 2022. Many of the homeless, however, say politicians have always exploited them with false promises. Over 150,000 homeless are braving the harsh cold on the streets, pavements, and under flyovers in the city, according to reports. This entry was posted in Asia Pacific and tagged Cold Weather, Delhi, Homeless, homeless folks, Indian Capital, Minister Narendra Modi, NEW DELHI, northern India. Bookmark the permalink.